11:03 I got caught in the "hook", but I extracted it, cleared my mind, and took the "go"
10:52 aborted -1 ; the 110 EXMA lost its "curl"
12/5/2003 01:40:10 PM Mountain bkw:: out basically flat. 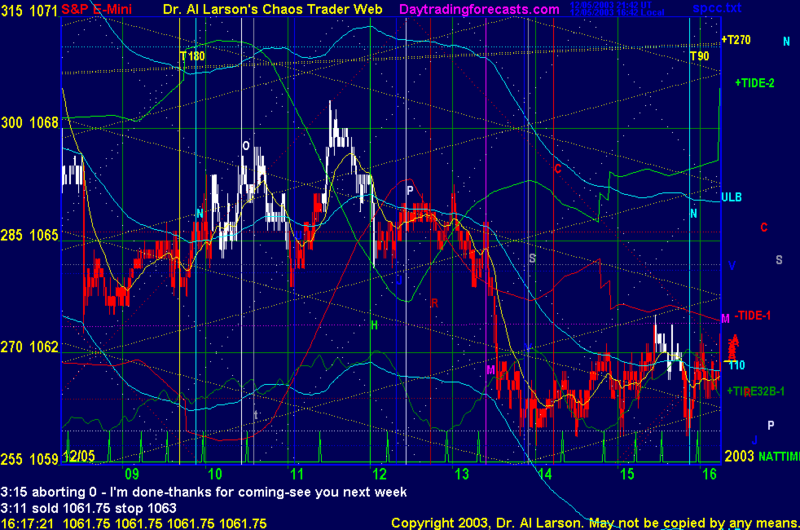 12/5/2003 12:58:30 PM Mountain bkw:: tnks AL-I stiull think we fall apart before the close?? 12/5/2003 12:47:50 PM Mountain bkw:: out plus six and a bit. 12/5/2003 12:07:58 PM Mountain bkw:: if the e wavers are right? this could get real nasty wave 3 of 3 down. 12/5/2003 11:55:35 AM Mountain bkw:: Ooooooh yaaaaa! 12/5/2003 10:30:20 AM Mountain bkw:: with a seatbelt on. 12/5/2003 10:23:54 AM Mountain Al:: my kidney doctor had 30 years experience, and he had never seen a case like mine-he said it was a 1 in a million freak accident. My stars were not good that day, but it turned out to be a spike low, followed by a great rally, still going strong. 12/5/2003 10:22:50 AM Mountain bkw:: You are indeed a lucky man! 12/5/2003 10:20:11 AM Mountain dst:: absolutely unbelieveable Al! 12/5/2003 10:18:36 AM Mountain Al:: I didn't know about the bleed for several days. I just got up, dusted myself off, and finished the job. A few days later I got a real bad stomach ache as I slowly bled internally. Wound up in hospital for 7 days. All they did was wait to see if the back pressure stopped the bleed, and give me a few - too few - pain killers. Couldn't open me up because that would reduce the back pressure and I'd bleed to death before they could find and fix the bleed. After my NDE I made myself get up and start walking, and got out of there. Hospitals are awful. Took me 8 weeks to rebuild my energy. 12/5/2003 10:12:18 AM Mountain bkw:: Picture Al hanging from the roof by a rope well the neighbor says to hus wife-Al must have had a bad day in the market. 12/5/2003 10:04:53 AM Mountain dst:: that sounds even more exciting - did Lassie go for help? how'd you get OFF the roof? 12/5/2003 10:02:04 AM Mountain Al:: I did not fall OFF my roof - I slipped on snow and fell a short 2 feet ONTO my roof. But when I hit, the impact jerked a kidney and started a bleed. I had a safety rope on, and it kept me from falling off the roof. But I agree, I am lucky to be alive. 12/5/2003 09:55:59 AM Mountain bkw:: stop 1069-moon grease applied. 12/5/2003 09:38:22 AM Mountain wlj:: dst, i hear of so manny people falling off ladders or the roof. my cousin fell cleaning his gutters, broke his pelvus in 3 places. laid up a long time. al is lucky to be alive. 12/5/2003 09:35:19 AM Mountain Al:: wlj: my lights are up already-since I was reborn, I'm a kid again, so climbing is no problem-now I just make sure the roof is dry. 12/5/2003 09:31:56 AM Mountain bkw:: sold 1068 stop 71-dst-grin! 12/5/2003 09:23:56 AM Mountain wlj:: al, re: last nights email, will you be hanging xmas lights this year ? 12/5/2003 08:39:38 AM Mountain bkw:: I had it as 67.50 MM close enough-the big number to me is 1063-if we brk that free-fall! 12/5/2003 08:25:16 AM Mountain bkw:: soon Al-soon! 12/5/2003 08:13:27 AM Mountain Al:: no shots yet, bkw?